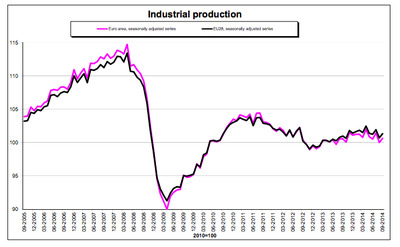 Industrial production in the eurozone rose by 0.6% between August and September of this year, according to figures released by eurostat on Wednesday. This is slightly lower than the 0.7% month-over-month increase economics were expecting. The 0.6% rise in September is due to capital good production rising by 2.9% and energy by 0.3%. Meanwhile, durable consumer goods fell by 2.6%., eurostat said. Industrial production increased by 0.6% year-over-year in September.